Jerry Alexander was born in Chingford and later moved to South West Essex, a location with big landscapes, scattered farms and a rawness to the agriculture of the area. A Chartered Architect by profession, Jerry studied Architecture and the History of Art at the Universities of Durham and Newcastle upon Tyne. 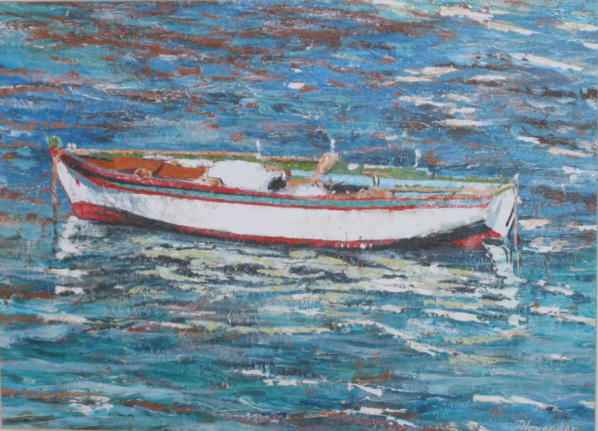 Jerry Alexander is now an established figure on the contemporary art scene and has played an active part in art in West Essex, having been a member of Islington, Essex and Theydon Art Clubs. Jerry Alexander's background greatly influenced his early painting experiences, working entirely out of doors in all weathers. Today Alexander alternates between site and studio. Jerry Alexander’s interest focuses on East Anglian and Mediterranean. He is drawn to the way light and shade break up and change their mass. Jerry Alexander recent abstract images are based on a fluid interpretation of landscape. His contemporary paintings are rich colour and texture. Alexander uses bold colours generating energy, persuading us not simply to view the landscape, but rather to experience its true essence. Jerry Alexander paintings can be found in art collections in the United Kingdom, France and Japan.